Some recollections and pictures from my Dayton 2018 trip. IF YOU ARE HERE for the slides and accompanying article for my FDIM seminar presentation, you can find these lower down on this page. Well, what can I say. It was 4 flights. 27 hours door-to-door, starting at 4am in the morning. After a mere 2 hours sleep, once I was done packing all the QRP Labs kits into my suitcase. If you're 6'5" (1.96m) tall and you aren't rich enough to fly business class, then sleeping on planes isn't that easy either. Still, as you can see, I'm here to tell the tale, so evidently I survived. 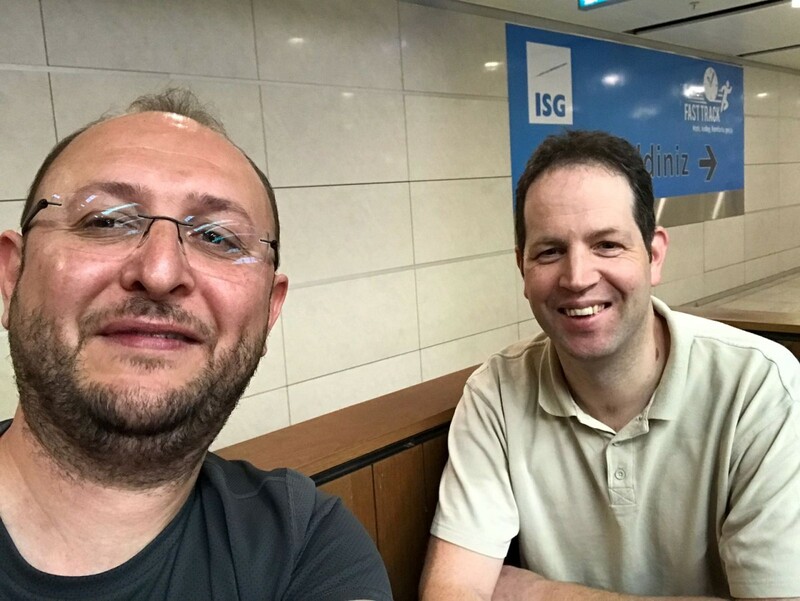 It so happened that I had a 4-hour wait in Istanbul's Sabiha Gokcen airport (SAW). It also so happens that Mustafa TA2MUN lives rather near SAW airport. Mustafa is David "Balloon Dave" VE3KCL's Turkish version! He flies High Altitude Balloon flights launched from Istanbul and has this website https://picoballoon.ist/ which is in Turkish - but if you can't speak Turkish then you can easily use Google Translate on it, or the Chrome Browser will do this automatically. I was so honoured that Mustafa took time out of his schedule and came to enjoy a nice coffee and long chat at Starbucks. We talked such a lot that time passed quickly then suddenly I was almost late for my flight... had to run all the way to the gate, which of course was absolutely the furthest one from check-in. Just in time for "last call". Thanks Mustafa! 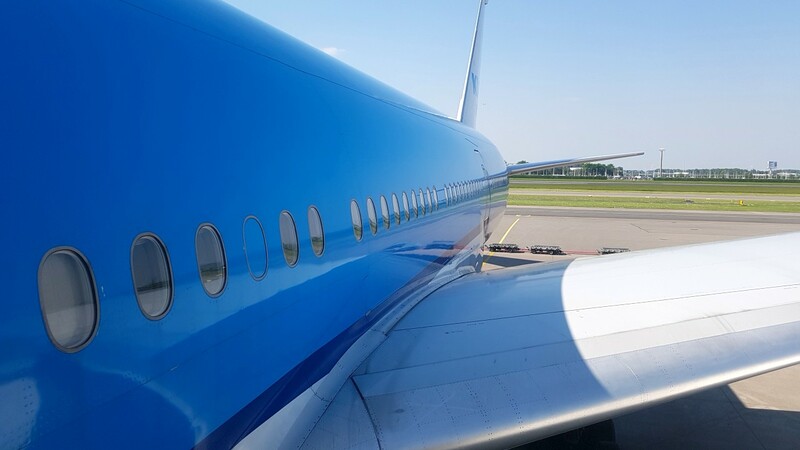 Left: KLM's plane that took me from Amsterdam to Atlanta. 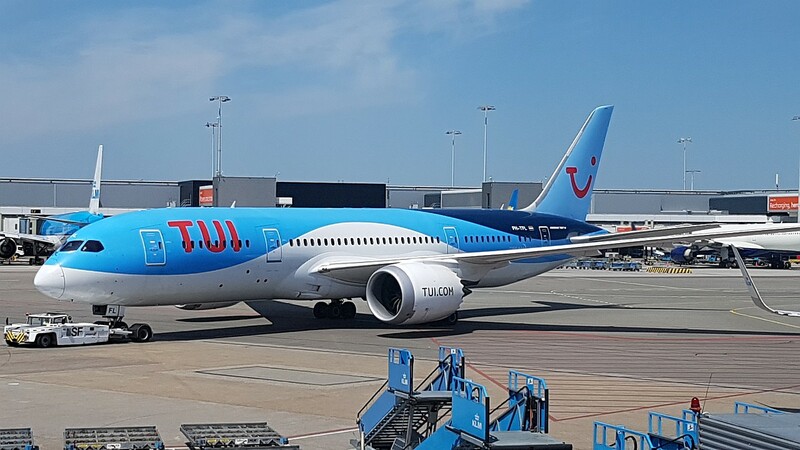 Middle: This picture is nothing to do with anything, but it was a nice snap to send to the Junior lab tech who is rather obsessed with planes. 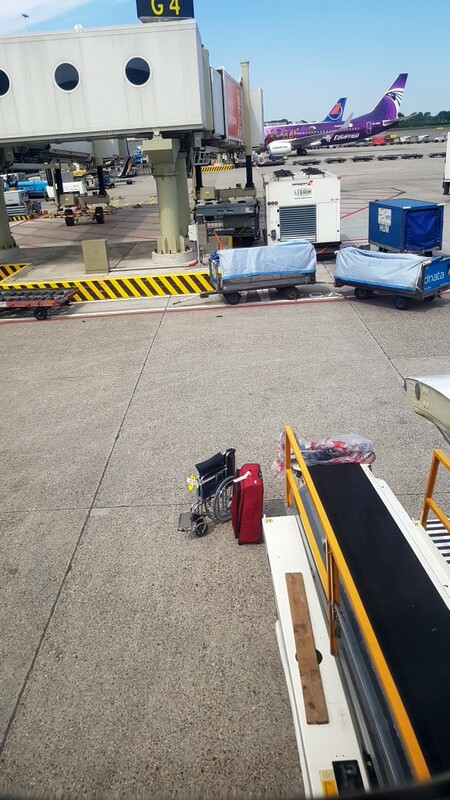 Right: This picture is at Schiphol again but now on the way HOME from Dayton... and that red suitcase is mine! Containing the leftover remnants of QRP Labs kits which weren't sold at the Dayton booth, as well as a few other fleamarket trophies and the XYL's Walmart shopping requests. Why is my suitcase sitting on the tarmac next to the plane, rather than loaded onto it? Because during the extreme intensive additional security screening to which I was subjected at Dayton airport on the way home, somehow the boarding pass for my future flight leg appeared to have been mislaid by someone. So when I reached Schiphol I found I had no boarding pass, though the suitcase still thought it was on its way to Istanbul. That confusion was finally resolved and the gate steward assured me it would get loaded on to the plane. There were a few nail-biting moments while waiting to see if that assurance really came to fruition (it did). FDIM (Four Days In May) is QRP ARCI's annual QRP extravaganza, at Holiday Inn Fairborn. The first day (Thursday) consists of seminars, of which I presented the first one of the morning, this year. I received many complimentary comments after the presentation. This presentation was recorded by Ham Radio Workbench podcast and will be available to listen in the near future. HERE IS A PDF OF MY SLIDES for the presentation. FDIM presenters are asked to provide an accompanying article to be included in the FDIM conference proceedings booklet. I provided quite a lot of information in my article, plenty of detail on the topics I briefly mentioned in my presentation. There is a detailed description of how to configure the Si5351A to produce quadrature (90-degree phase shifted) on two of its outputs. QRP Labs was the first implementation of this technique resulting in reliable glitch-free tuning with the 90-degree phase offset precisely tracking tuning changes. There's also a discussion of the transmit signal chain, including my "ghetto" Class-E calculation technique (which was left out of the 45-minute presentation). HERE IS A PDF OF MY FDIM CONFERENCE PROCEEDINGS ARTICLE accompanying my presentation. HERE IS A LINK TO THE HAM RADIO WORKBENCH PODCAST https://www.hamradioworkbench.com/podcast/2018-qrp-arci-fdim-hans-summers-g0upl-and-dr-jack-purdum-w8tee of the presentation. 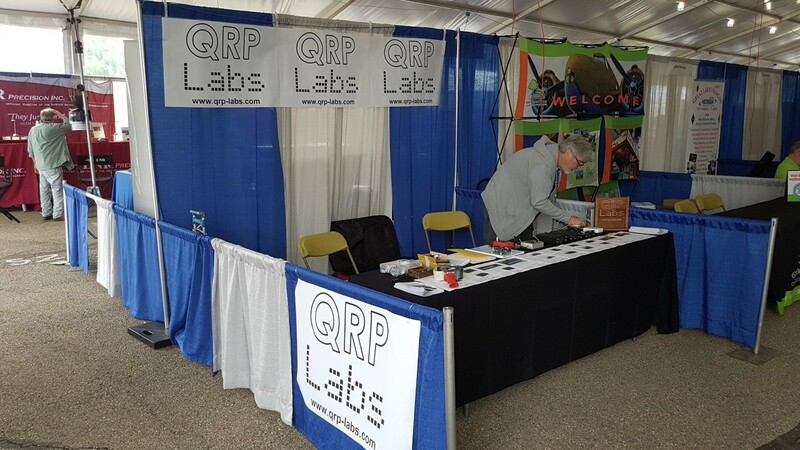 The big event arrived and here's some pictures of the QRP Labs booth at #6614, in tent 6, in the calm before the storm. David "balloon Dave" VE3KCL (the real Dave, not Mustafa TA2MUN Dave's Turkish version) helped me man battleship QRP Labs throughout the FDIM vendor night and 3 days at the hamvention itself. MANY THANKS DAVE! 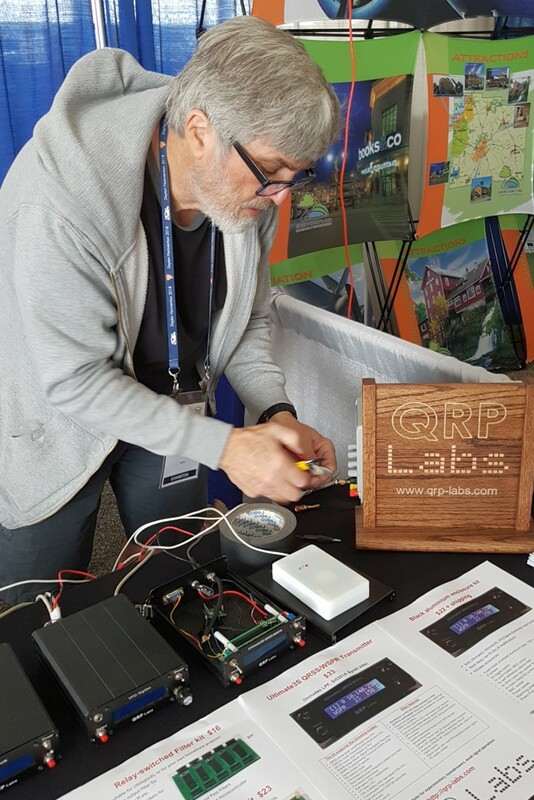 Most of the QRP Labs kits were on display or demonstratable, particularly the very popular QCX CW transceiver kit of which 165 kits were purchased (FDIM vendor night and the hamvention combined). 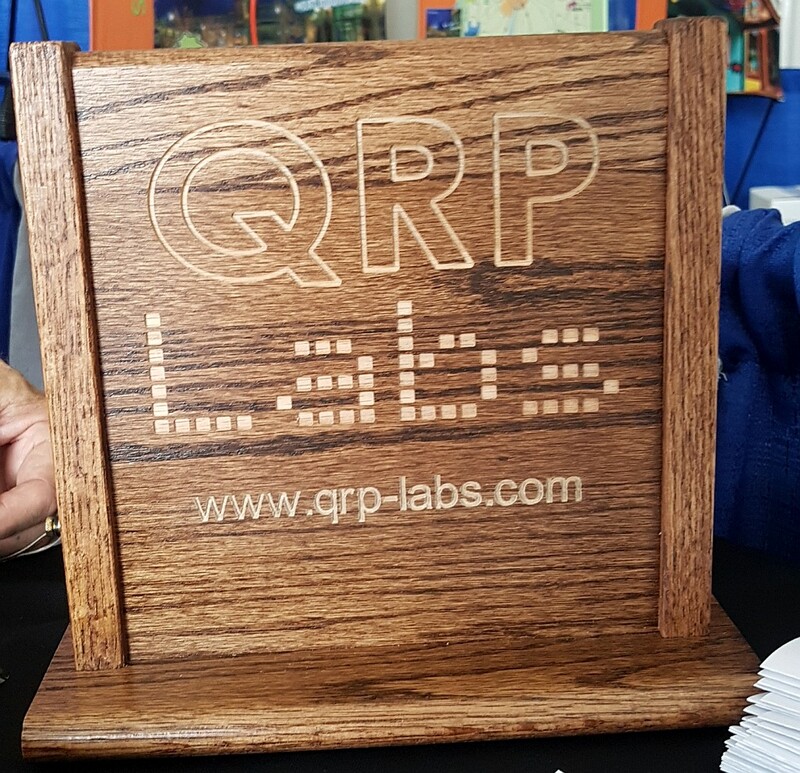 Almost all of the other QRP Labs kit range was in stock too, at least at the beginning of the hamvention (some sold out later). 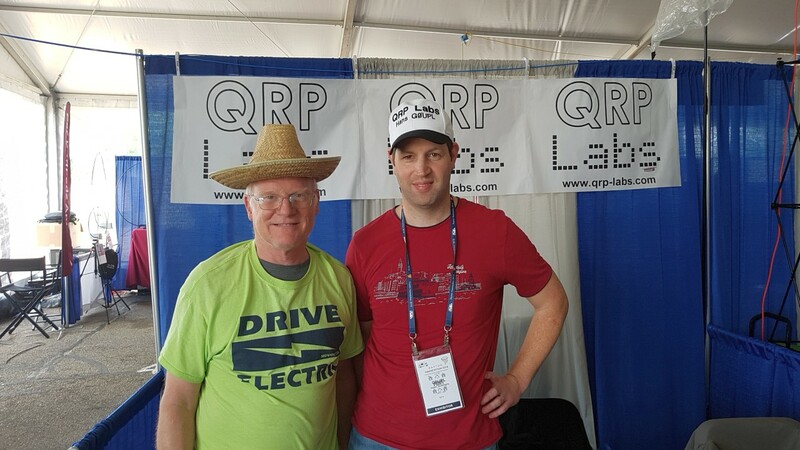 BELOW LEFT: Dave and I proudly display our new QRP Labs embroidered baseball hats. 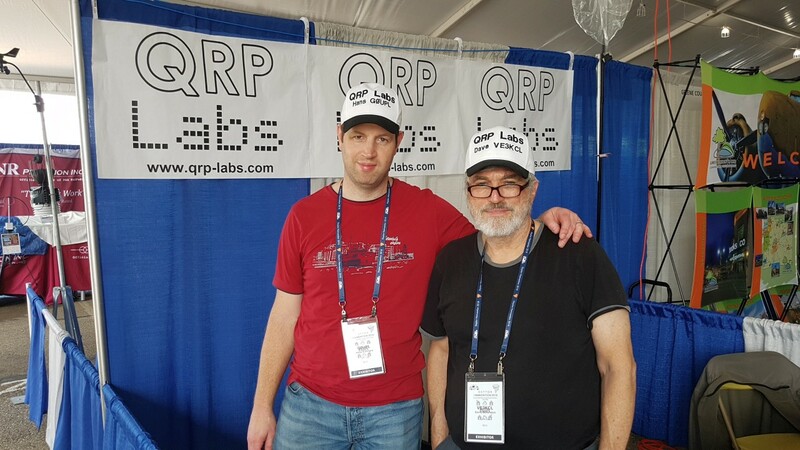 The QRP Labs brotherhood. 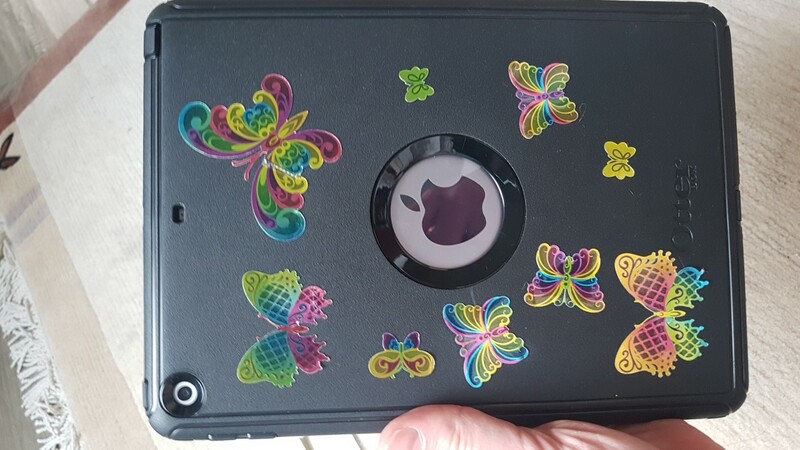 BELOW MIDDLE: Chris KC0TKS made this beautiful wooden plaque for us, thanks Chris! BELOW RIGHT: The moment of truth when Dave VE3KCL is just about to connect the QRP Labs kits to his power supply, and we get to find out if we connected up all the kits correctly as we had intended (we had). 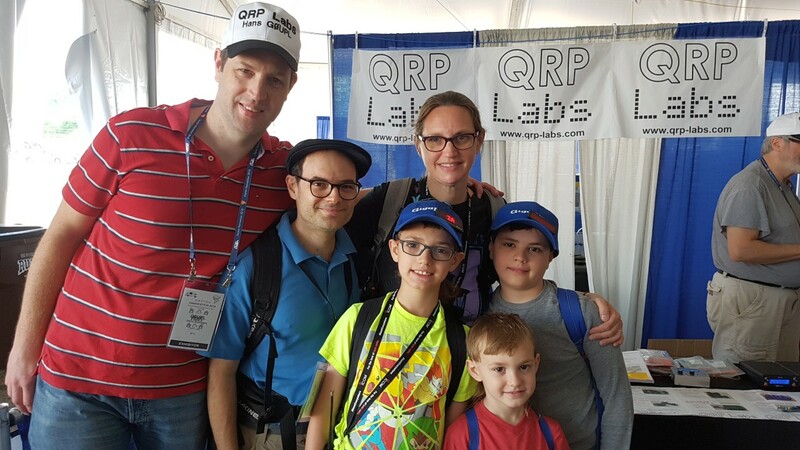 They bought three QCX kits and a dummy load, with Zachary KC3JKL (age 10) determined to take the crown as the youngest QCX constructor - the current record holder is age 12. An amazing and inspiring family! 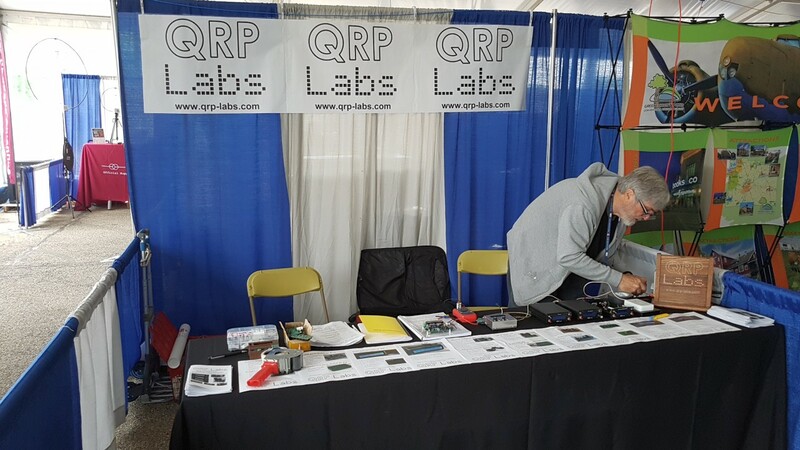 BELOW RIGHT: after demonstrating a QCX kit and convincing this fellow to buy one, I found out he's Bob WB4APR, the guy who invented APRS! He returned again the following day and bought a second QCX kit. 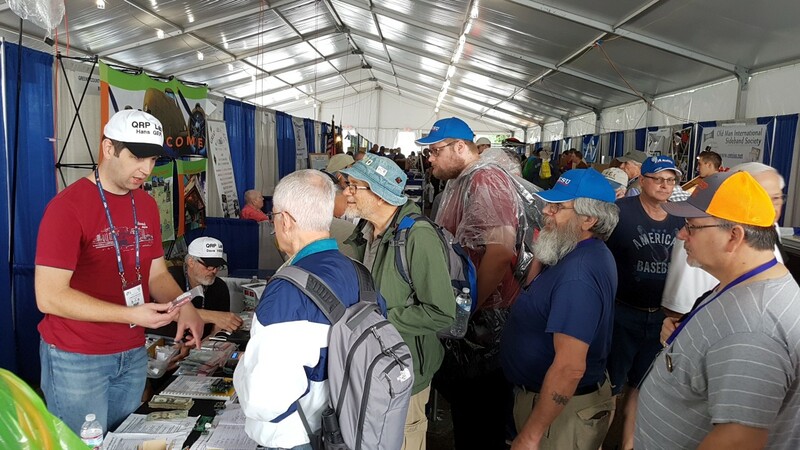 I was interviewed for the podcast and you can hear me at the beginning of the Hamvention 2018 interviews podcast, CLICK HERE. That journey home was 25 hours door to door but this time I was massively more tired than on the way... so I did drift into a coma several times during the various flights.